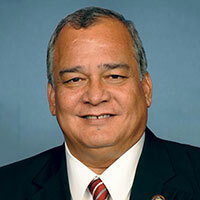 Gregorio Kilili Camacho Sablan is the first and only person to have represented the people of the Northern Mariana Islands in the U.S. House of Representatives. He began service on January 6, 2009 and has been elected to office five times. During his five terms in office, Congressman Sablan has been responsible for legislation increasing funding to Northern Marianas schools and individual students, to the Commonwealth Healthcare Center, and for water and sewer projects in his district. He expanded federal food and energy assistance for low-income families in his district. And his legislative work resulted in the return of ownership of submerged lands around the Northern Marianas to the people he represents. Congressman Sablan also took an active hand in easing the transition from local to federal management of immigration in the Marianas through assistance to individuals, working closely with the U.S. departments of Homeland Security and Labor on implementing policy, and by enacting into law extensions of a number of transitional policies. In 2017, Congressman Sablan received a waiver in order to obtain a seat on the House Veterans’ Affairs Committee and is now actively engaged in improving services for veterans in the Northern Marianas. He also serves on the House Committee on Natural Resources, and the House Committee on Education and the Workforce.